As a men’s stylist, I’ve been asked numerous times if I had a certain technique to matching my pocket square and lapel pin, and working them with a shirt or suit. There honestly isn’t a right or wrong way to mix pocket squares or lapel pins. They are an extension to the suit; accessories that better define you or portray who you want to be. That being said, I do like to keep to a couple of guidelines when I wear them. The placement of the pocket square and lapel pin is usually both on the same side – the left side. Because of their proximity, I always like to make sure that their colors don’t clash, but rather match (not completely!!) or complement each other to create an aesthetically pleasing addition to the suit. I like to choose the lapel pin first, because I have more pocket squares than I do lapel pins, and then base my pocket square selection on the colors of the pin. 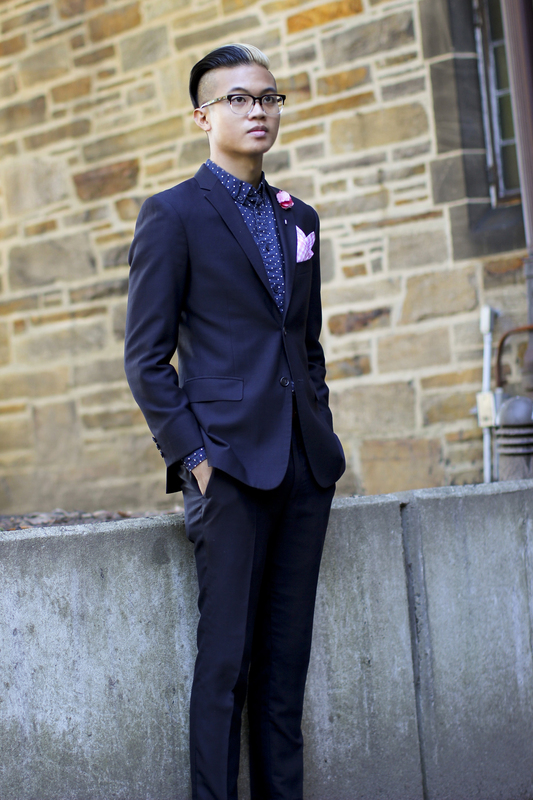 In this outfit, the lapel pin that I chose had a mix of pink and fuchsia. 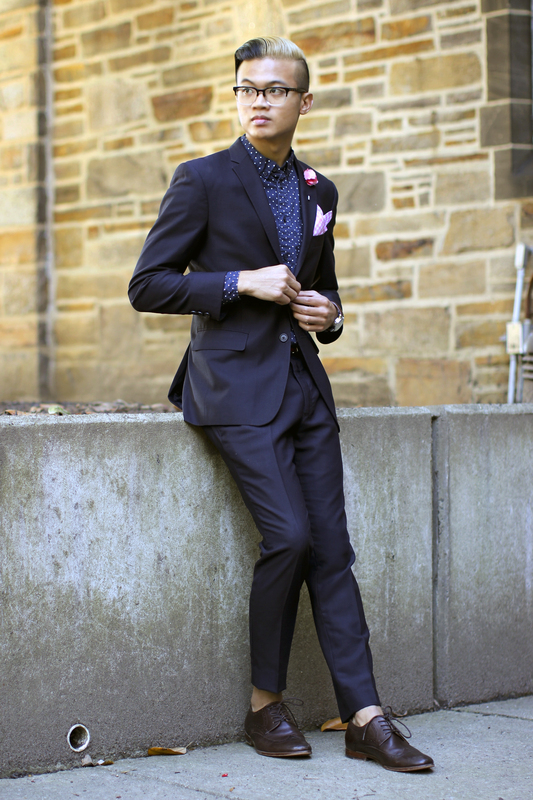 From here, I can choose to go with a pocket square with a matching pink or fuchsia hue, or go with neutral colors that would complement the colors – white, light blue, navy, grey, and so on. I went with a matching pink-colored pocket square with a gingham pattern to match the lapel pin. If the lapel pin is a very small pin, I like to wear my pocket square conservatively as well so that it doesn’t overshadow the lapel pin. Think of the two as honor students. One student doesn’t want to be overshadowed by another student! Keep the pocket square fold simple if the lapel pin is small, and exaggerate the pocket square fold when the lapel pin is blooming. It’s never a bad idea to have a pattern in at least one of the accessories. Most lapel pins do not come in special patterns, so most of the times, it is best to wear a pocket square with patterns. Patterns add energy to the suit. Of course there are times when solid colors are more appropriate, but it doesn’t hurt to be bold especially if you are trying to get noticed. However, it is a different situation when you are wearing a suit or shirt with a pattern. In that case, check out the article I wrote about mixing and matching patterns here. 4) Two Is Better Than One. But Three? Not Fun. Unless I’m gifted a trio set, I prefer not to wear a tie, a pocket square, and a lapel pin at the same time. Over-accessorizing can be detrimental to an outfit and make it look costume-like. Try to stick to at least two accessories of the trio (tie, pocket square, lapel pin) to prevent from accessory overkill. Style is a personal expression, and everyone’s is different. So take my advice with a grain of salt. If you think otherwise, be yourself and wear your style proudly. What are your guidelines? Leave in the comments below! 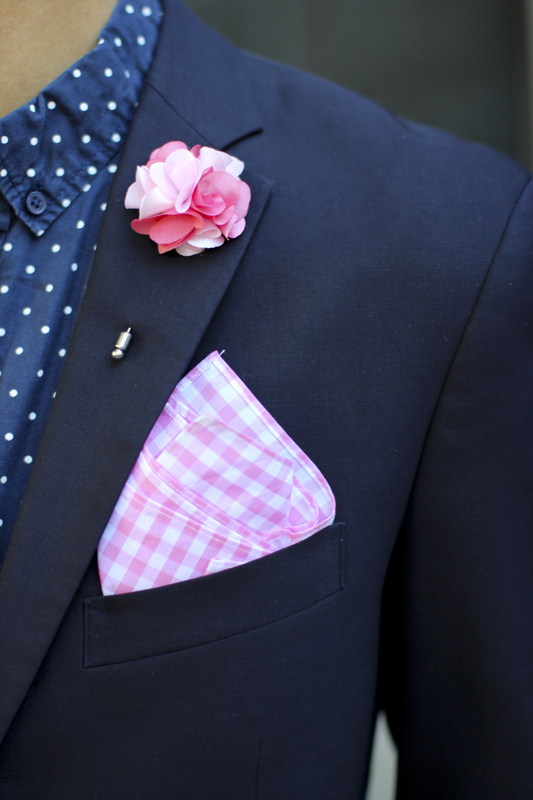 The Pocket Square and Lapel Pin used in this outfit are courtesy of Howard Matthews Co.
Pocket Square – Gingham Pink Bay – Howard Matthews Co.
Lapel Pin – Karen Pink – Howard Matthews Co. 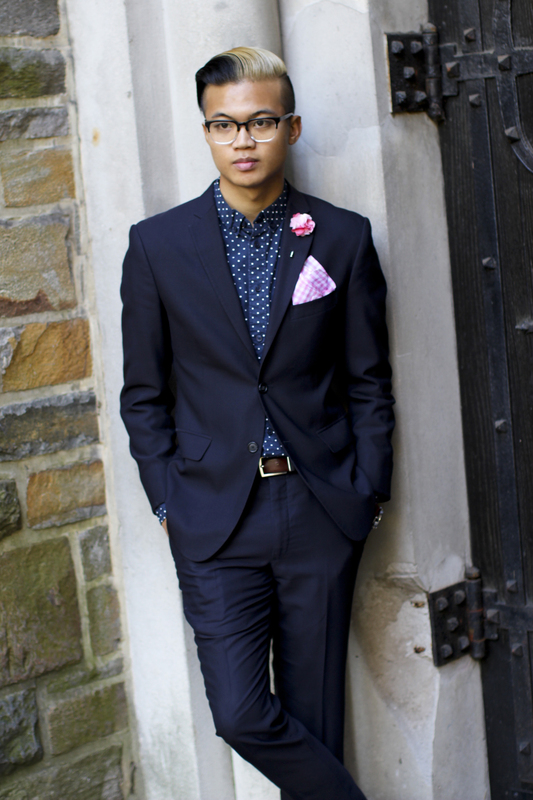 Tags: Baltimore, Blogger, Clothing, DC, Fashion, How to, Howard Matthews Co, Lapel Pin, Mens Fashion, Mensstyle, Menswear, Pocket Square, Style, Style Tips. Bookmark the permalink.